Paris, December 1897. Two years after the bitter failure of his play The Distant Princess, Edmond Rostand still can’t find inspiration. The great actress Sarah Bernhardt, one of the few to continue to encourage him, arranges for him to meet Constant Coquelin, one of the greatest living French actors. Coquelin expresses a desire to star in Edmond’s next play. 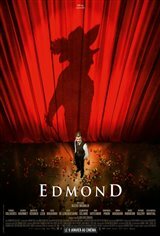 Edmond comes up with a title : Cyrano de Bergerac. However, he hasn’t written it yet and isn’t sure what the story will be about, but is told it has to be presented on stage in three weeks.